"Wait, I thought my Saber was supposed to be male..."
Oh, you and your plotbunnies. You need a plotdog, and a plotfence. Something to keep them out of your plotgarden. ... this metaphor broke down somewhere. Write, Beamu! Peer pressure compels you! And hmm, Canon!Gil or Prototype!Gil? Maybe both? That'd be a laugh, that's for sure. It could be worse. It could be Nero Saber. 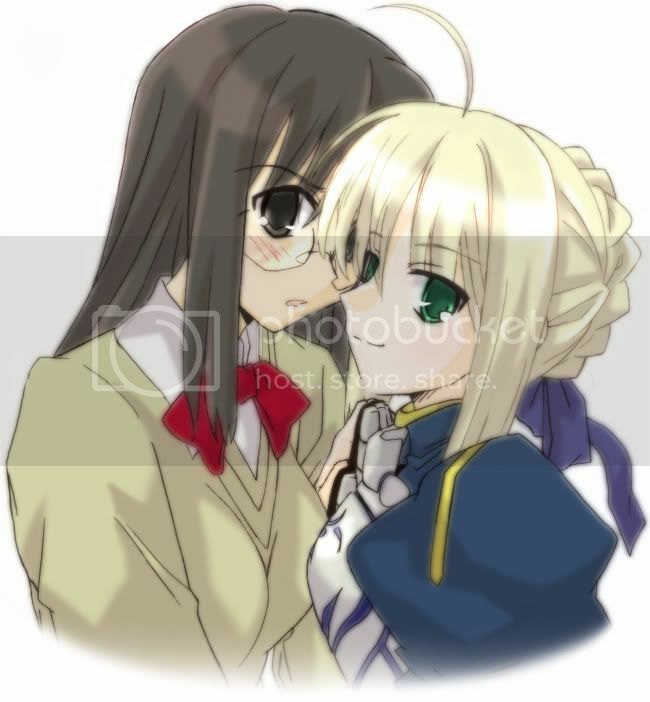 ......And so did the yuri fans squee. ^ I smell a sitcom! It will be like Three's Company, except they're all women. @Dark Pulse: Not sure if it would make as much sense that way. @Ogodaka: Who's the third one you're thinking of? If it's Rin, I think you'll be disappointed. Ayaka, Arturia, and Nero of course. @Lycodrake: Yep, just what Dark Pulse said. Ayaka, Arturia, and a tsun-tsun Nero Saber. Oh, just imagine the wild shenanigans they would have. Saberrrr! "I told you two to not flush the toilet while I'm in the shower! You KNOW what that does to my skin!" Into The Rain: Officially Dead. Internet Browsers and Other Such Things.